LensKart is one of the leading online websites to buy eye glasses in India. Lenskart has come up with a wonderful offer. 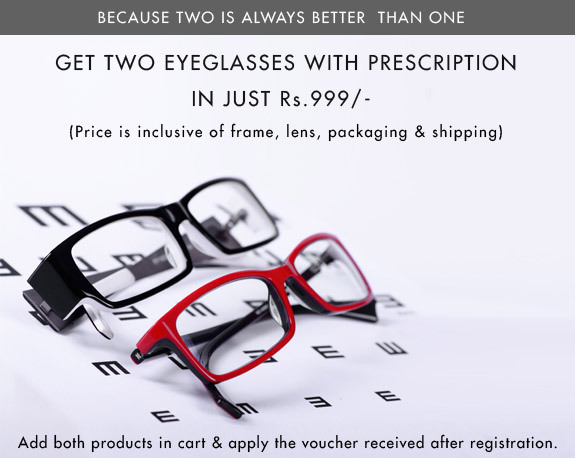 Now you can buy 2 eyeglasses with prescription in just Rs.999 only. The price is inclusive of frame, lens, packaging and shipping. How to avail this Lenskart Discount Offer? 1. Register with required details here. Only people with new registrations are eligible for this offer. 2. You will get an exclusive Lenskart coupon code after registration. 3. Add 2 products in the offer page to cart. 4. Apply the coupon code and buy. 1. This offer is valid on eyeglasses only. 2. The offer is only valid for users who registers for first time. 3. The coupon code can be used only once after filling your details. 4. The offer is only valid on selected products at the offer page. 5. The products under this offer cannot be returned. 6. The offer will stand cancelled in case of address/contact information is changed or found to be incorrect after dispatching the order. 7. The order will be processed and the offer will be valid only post a payment capture. In the event of failed transactions, offer will stand void. The order will still be processed, however, will be under normal course post the payment is captured, not under 3 or Free offer. 8. All disputes are under Delhi jurisdiction. 9. Limited time offer only. 11. Terms and Conditions by Lenskart are applicable.